Rihanna was out in Milan, Italy last week to launch new products from her Fenty Beauty collection. Following the launch event, she showed off a cute look on instagram on Friday(April 6th). 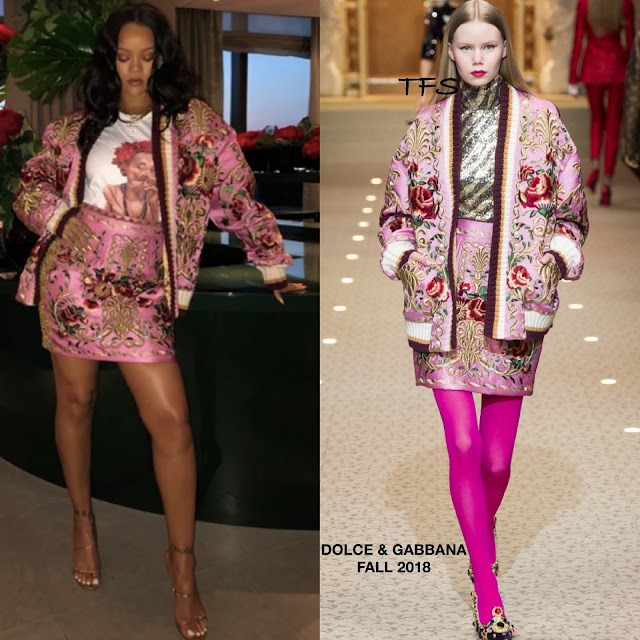 She posed for the gram rocking a DOLCE & GABBANA FALL 2018 pink floral embroidered & rib panel jacket with a white printed tee shirt underneath and the matching pink embroidered mini skirt. I think Riri pulled off this printed look which she offset with gold sandals sandals. Wearing products from her beauty collection, she finished up with center part curls.